Can Dogs Eat Honey And Is It Safe For Them? 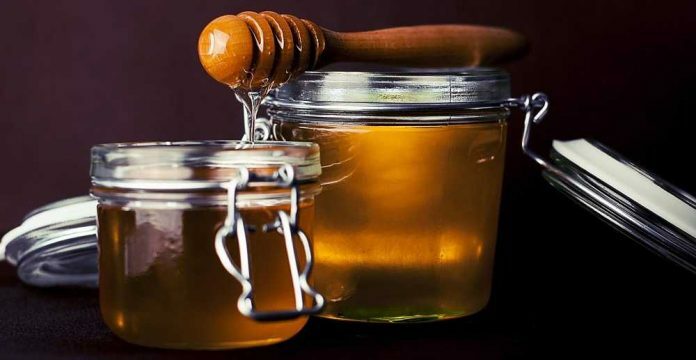 Honey is sweet and tasty but it’s had something of a bad reputation for being unhealthy due to the amount of sugar it contains – honey is in fact typically about 80% sugar. However, despite this bad reputation honey actually has a lot of health benefits. In particular it’s full of antioxidants. As you’re probably well aware though, not all foods that are good for us humans are good for dogs (in fact, some of them can even be fatal) and one of the most common questions I get asked is can dogs eat honey and is it good for them? So in this article I will briefly cover the health benefits of honey for dogs. The short answer is that honey is indeed safe for dogs to eat. And what’s more, most dogs love honey and this makes giving it to them very easy. In fact some dogs will even simply eat it right off the spoon. If not, you can add it to their regular food. And some dogs, mine included, love honey on toast as a tasty treat. It’s all very well saying that dogs can eat honey but that still leaves the question of is honey good for dogs? As I mentioned above, honey has many human health benefits and as it turns out, dogs get many, if not all, of the same benefits too. Raw honey is best, as all the natural vitamins and other nutrional goodies are still in it, unlike processed honey. One note of caution is that you should be wary of giving honey to young puppies as it can contain botulism spores. Older dogs have a more developed immune system that can cope with this, but younger puppies with more immature immune systems can’t. So steer clear of giving honey to your dog until they’re a little older. It’s great for increasing a dog’s energy levels. It also acts a moisturizer for their skin and coat. You can even make your own home-made honey shampoo for your dog. Honey is also good for a dog’s digestive system. Note, if your dog does have digestive problems you should take them to a vet. It’s also great if your dog suffers from allergies. As with humans, local raw honey is best for allergy relief. Honey has antioxidant and antibacterial properties that help prevent heart disease and some cancers. Honey also has positive antiseptic qualities. As usual, it’s best to only give your dog honey in moderate amounts. Too much honey and your dog may end up bigger than you intended! And too much can also give your dog diarrhea or cause it to have an upset stomach. As a general rule, keep doggy treats to a minimum and make sure your dog’s regular diet consists of one of the best dry dog foods. The answer to the question “Can dogs eat honey?” is yes. Dogs can have honey perfectly safely and in fact it provides them with lots of health benefits. You should only give your dog honey in moderation though, and don’t give it to young puppies. Thanks Christal. Yes, honey has some amazing properties that are great both for us humans and for dogs too!